Digital Audio Broadcasting vs FM Radio in Italy. The transition to Digital Radio gradually proceeds along the Italian peninsula. After Trentino Alto Adige and Valle d’Aosta, the first two regions to switch to DAB+ (the latest version of DAB technology), over the last 2 years, the digital network has been largely extended: new installations have been set up, in most of the northern and central Italy, thus ensuring a wide coverage. The same cannot be said for the South: as shown on the map, the digital signal is unevenly distributed. 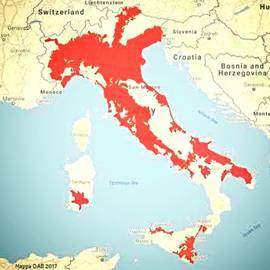 It is concentrated mainly between Apulia and Campania, while touching small portions of Basilicata, Calabria, Sardinia and Sicily. Despite the fact that DAB Italia, EURODAB and RAI­­ – the main digital network operators –keep working to extend and enhance signal coverage, there are delays. Why the transition to DAB continues to be slow going? Cumbersome bureaucratic procedures and territory geographical conformation act as major factors in slowing down the implementation process of DAB technology. It means that it is currently possible to listen to digital radio mainly in the largest urban agglomerations, whereas a lot of small towns and extremely hilly areas remain analogue. Moreover, digital transmission is principally used by the major national broadcasters that were reserved special treatment in the granting of radio frequencies. In fact, due to the lack of free bands, local networks have been rather marginalized and continue broadcasting on FM frequencies. Added to that is the fact that most of the cars are not all equipped with digital receivers and hybrid receivers, operating in both digital and FM modes, especially needed in areas where digital coverage is weak, are not easy to find on the market. In this context it is very likely to suppose a long term co-existence of FM and DAB technology, which is also suggested by a measure contained in the 2018 Budget Law establishing that Radio devices, from 2020 onwards, must be equipped for the reception of both Digital and FM signal. We will support you in whatever mode you choose. We have already led many radio stations towards the Digital Audio Broadcasting with our transmitters DAB+ and we keep providing our updated FM technologies for those who decide to enjoy the analogue radio advantages. Freedom of choice is a value we care for.